As expected, UFC 131 will take place June 11th inside the Rogers Arena in Vancouver, British Columbia, Canada. A thrilling heavyweight top contender scrap between former champ Brock Lesnar and Junior dos Santos will headline the pay-per-view broadcast. “Cigano” owns a nearly perfect 12-1 resume and has ended 11 of his victims before the final horns have sounded. 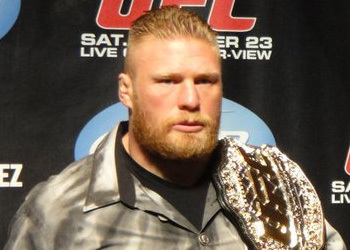 He posted a unanimous decision victory over Roy Nelson in his last outing, which earned him his ‘Heavyweight Top Contender’ moniker. The Brazilian was slated to challenge current title holder Cain Velasquez for his freshly minted crown, but a shoulder injury shelved Velasquez and forced the UFC to arrange another bout in the meantime. The news wasn’t all bad for 2Santos, as he was rewarded with “The Ultimate Fighter 13” coaching duties opposite Lesnar. Speaking of the former WWE superstar, Lesnar was steamrolled so badly by Velasquez for his strap at UFC 121, many believed his days of real fighting were over and done with. He holds a 5-2 MMA record, but four of his scraps have been of the championship variety. But enough about the 265-pounders, let’s take a look at the other bouts that have been confirmed for the extravaganza.